Dude – say what you want about Kim Kardashian (West), but her makeup is always fierce. Like, always. This is totally evidenced by her Instagram account, which is basically a gallery of her making the same face in different awesome makeup looks (mostly done by makeup artist mastermind Mario Dedivanovic [@makeupbymario]). 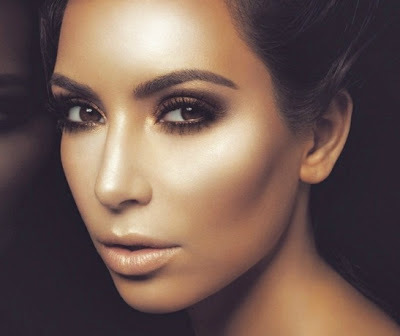 Kim’s makeup artist Stephen Moleski applies MAC Paint Pot in a shimmery creme to the inner corners of her eyes with an eyeshadow brush. Stephen uses the MAC angled brush to press MAC Carbon black eyeshadow as an eyeliner into Kim’s lashline. Kim’s brows are filled in with the same angled brush using MAC eyeshadow in Espresso, which Stephen adorably pronounces “ex-pressoh“. Stay tuned for the next installment, in which Kim will be adding false eyelashes. I can’t wait to share their tips with you! Whatever else you may think about her, you asked and she delivered: possibly the most sought after celebrity eye makeup look is that of Kim Kardashian, and apparently Kim knows about the high demand. The socialite and E! starlet posted a series of videos a couple of years ago on achieving her signature smoky eyes. They largely went unnoticed…but I’ve uncovered them for you!